Goggles, instruments, flying practice, Mk.2. Stores reference 22C/1136. By Polaroid. Single piece moulded black rubber frame with chamois backing that is essentially the same as that used in the USAAF B-8. Fitted with a deep blue tinted plastic/celluloid filter (lens) and a standard strap as fitted to the MK.VIII flying goggle. The frame, which has both manufacturer and refence details moulded into it, is in very good condition but would benefit from a quick clean. The lens appears to be in good order and the strap looks good but ony has a little elasticity remaining and corrosion on metal parts. 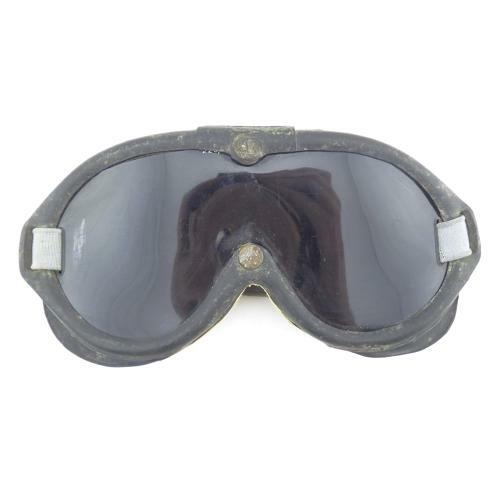 Very early post WW2 goggles. Unusual and now rarely seen. Stock code G22790.